The image of "tax havens" and the term "offshore" may evoke islands such as Jersey in the channel between Great Britain and France, the Cayman Islands in the Caribbean, or Cyprus, which served as a intermediary between the Ukraine and Paul Manafort's extravagant purchases in the United States. But, as this new report from the Hudson Institute explains clearly, the system is in fact "without borders," with money from the global rich, including authoritarian leaders, parked in many places, including the City of London, Delaware, and New York. This AfricaFocus contains excerpts from the report on "The Enablers," which is also available on the Hudson Institute website. Highlighting particularly the flow of money from authoritarian states to the United States, it spells out the role played by legal services, incorporation services, financial services, real estate services, lobbying and public relations services, fintech and cryptocurrency. For background on groups campaigning to change this system in the United States, see The Financial Accountability and Corporate Transparency (FACT) Coalition (https://thefactcoalition.org/). Globalization is playing out unexpectedly as governments, businesses, and individuals around the world are connected to one another at an unprecedented rate. These new connections were at first widely hailed as enhancing the influence of the United States, but their true political consequences are only just beginning to become clear. One of the most important but overlooked dynamics, given its national security implications, has been the pervasive networking of American professional services providers with power brokers and their acolytes from corrupt authoritarian states. Certain elements within the legal, financial, and influence communities, seeking new markets, clients, and profits among an emerging global class of super wealthy actors with fortunes of dubious provenance, have in the past fifteen years begun offering their services to transnational kleptocrats linked to authoritarian regimes. From Washington lobbyists with Kremlin-linked accounts to New York law firms with Chinese Communist apparatchik clients, these tie-ups have a detrimental effect on the political and the financial workings of American democracy—one that is only growing. This report argues that these professionals have become enablers of authoritarian influence within democracies in a twofold manner. First, they are facilitating the concealment, insertion, and deployment of kleptocrats’ illicit funds within Western economies. Second, they are using their skills and expertise to help kleptocrats establish networks of influence inside democratic societies. This relationship between Western professionals and authoritarian elites has not only fueled a boom in money laundering; it has transformed significant elements of the most distinguished, influential professions into wholesale importers of transnational corruption. Before we try to understand the enablers, we need to understand the system in which they thrive. For Western professionals, facilitating the finances of hostile powers is nothing new. They have always overseen the offshore financial dealings of hostile powers, particularly since the rise of the Eurodollar and the Eurobond in the 1960s, to a significant extent on the back of Soviet funds and as a result of the disintegration of the Bretton Woods system. Since the end of the Cold War, however, the tempo has shifted. The dismantling of totalitarian regimes across Eurasia allowed their elites to become individual financial actors for the first time. This dovetailed with an aggressive expansion of American professional services into these territories. Whereas in the 1960s it was the Soviet state seeking Eurodollars, by the late 1990s, any Eurasian power brokers worth their salt were personally seeking access to Western professional services. The consequences of this access to the globalized economy have arguably been vastly more empowering to political actors hostile to the United States than any other development of the late 20th century. But why? Since the Bretton Woods system collapsed, one financial trend has been constant: the aggressive expansion of a shadow financial system referred to collectively as “offshore.” On the surface, this is a fiendishly complex interlocking web of anonymously owned companies and accounts, legally located in secretive jurisdictions that allow them to circumvent the regulatory and taxation systems of conventional jurisdictions. Yet lifting the veil of corporate secrecy reveals a simple principle: Offshore is actually a set of professional services that specialize in enabling businesses and individuals to effectively retreat from legal, regulatory, and public scrutiny, empowering them vis-a-vis those who have remained “onshore” without access to such services. This system is how a business run, staffed, operating, and earning its profits in the United States can claim that it is in fact located in another country altogether, despite having no physical presence there. Profit margins provide ample explanation for the motivation to escape taxation but tell us little about the shape and scale of the system itself. This has been driven by targeted innovation in the legal and financial communities, empowered in the commanding heights of both the state and the private sector itself, which equated the dismantling of regulatory frameworks with automatically encouraging growth. This process was powered by new technologies that permit instantaneous transactions and emerging forms of secrecy, encryption, and concealment. The offshore system has turned Western professional services providers into partners for non-Western authoritarian elites and brought the latter into the Western financial system. “There are both ethical problems in the finance industry,” says Zucman, “and a collective intellectual failure at regulating tax havens and globalization.” Instead, perks set up to profit Western corporations have become sources of unprecedented power for kleptocrats. These powers—the power to generate, store, and deploy wealth in different countries, and the power of anonymity, which enables personal connections to that same wealth to vanish without a trace—are the common threads stitching together various global political trends. The increasing capacity of Russia, China, and even the Gulf States to interfere in Western political systems, and the eruption of protest movements in countries as varied as Malaysia, Ukraine, Libya, Egypt, and Pakistan, are all fueled by the power that the offshore system has bestowed upon authoritarian elites—and how they have played, abused, or mismanaged their hand. Money may not explain everything—but it does explain rather a lot. Given the vast figures involved, it is often tempting to discuss global financial flows from a systemic point of view. However, zooming in, we realize that no individual transactions—and especially no illicit ones—happen without a helping human hand. Taking this view enables us to better understand the role played by professionals within Western legal, financial, incorporation, and real estate communities who have become systemic enablers of transnational kleptocracy. The boom in global money laundering that continues to empower authoritarian kleptocrats and fuel their growing influence would not be possible without them. Studying the intersection of Western professionals with these kleptocrats is essential to understanding this trend in modern power. Thanks to a surge in investigative reporting and academic studies, the pattern by which kleptocrats typically operate in the United States and other democracies has been clearly established in recent years. First, a kleptocrat will engage legal and incorporation service providers to place illicit funds into the legal economy and conceal their origins. Second, financial and real estate professionals are used to integrate the funds into the mainstream U.S. economy. Third, lobbying and public relations specialists can suppress scrutiny of the kleptocrats, whitewash their criminal past, and extend their political reach. This well-trodden path has emerged from two systemic failings: an outdated and inadequate anti-money laundering (AML) system, and the failure of ethical standards and self-regulation within the professions themselves. The first port of call for any kleptocrat seeking to benefit from this system is contact with the legal community. A lawyer is utterly essential, both to enter the offshore world and then to exploit its complex landscape, which cannot be navigated by anyone legally blind. From there, lawyers typically engage incorporation agents (if they cannot provide the service of company formation themselves) before managing the kleptocrats’ offshore affairs. This includes providing introductions to the financial community, specific investment opportunities such as real estate, and even political opportunities such as contacts with lobbying or public affairs professionals. Unscrupulous lawyers have become the primary accomplices of transnational kleptocrats. This is abundantly clear from the trickle of kleptocrats who have been brought to justice in the United States. In recent cases prosecuted by the Kleptocracy Asset Recovery Initiative of the Department of Justice, in which members of the American legal community played a key enabling role, the defendants included Pavlo Lazarenko, former Ukrainian prime minister; Chen Shui-bian, former president of Taiwan; and Teodoro Nguema Obiang Mangue, current vice president of Equatorial Guinea. Legal services were their primary guides. The legal community’s services to kleptocrats sometimes extend far beyond advising them on their rights or conducting litigation. They often include business and investment advice; handling illicit funds in their clients’ trust accounts; setting up corporate entities or handling interactions with incorporation agents on their behalf; and introducing them to other professionals in the financial, lobbying, and public relations communities. The role of the legal community in facilitating transnational kleptocracy needs to be reassessed. Cases in which kleptocrats have been caught and prosecuted in the United States show that American legal professionals operate not merely as enablers, but also as force multipliers for kleptocrats’ economic and political influence within democratic societies. A dangerous minority of legal professionals has been abusing important legal protections—such as attorney-client privilege—in order to use them as cover for illicit activity. These practices have made the legal community an importer of weaponized corruption into the United States. Once illicit funds have been laundered into the U.S. economy, they are not just stashed in luxury real estate. They also have the potential to be deployed in the service of bad actors—including to further the geopolitical ambitions of adversarial states like Russia. However, even the most casual look at the networking between the legal community and authoritarians shows that the profession is falling short of these standards and neglecting its role. “For years now the ABA has been downplaying the role of lawyers in money-laundering misconduct, claiming that voluntary anti-money laundering efforts are sufficient when it’s clear lawyers, like banks, should operate under mandatory AML requirements,” said Elise Bean, a former staff director of the U.S. Senate Permanent Subcommittee on Investigations, who conducted multiple money-laundering investigations. Congress should pass legislation requiring legal services providers to perform reasonable due diligence on prospective foreign clients. Given the potential for abuse of attorney-client privilege, Congress should consider whether legal firms should continue to be able to combine business, lobbying, legal, and other functions. Congress should also consider whether IOLTA accounts should be subject to the same anti-money laundering regulations as other financial products. Though authoritarian kleptocracies differ from each other in their nature and in the quantity of funds they bring into the Western financial system, investigators from U.S. law enforcement are quick to point out that almost without exception, when they enter this system, they make use of anonymous shell companies. “We consistently see bad actors using these entities to disguise the ownership of the dirty money derived from criminal conduct,” Kendall Day, then acting deputy assistant attorney general of the Justice Department’s Criminal Division, told a Congressional hearing in January 2018. Anonymous shell companies differ from other money-laundering vehicles such as “front” companies in that they are legal entities that grant the rights and privileges of a company to the owner without obligating the owner to perform any of the activities typically associated with a company. Usually they are deployed within a vast, complex network of other such companies that are legally located across multiple jurisdictions. This renders the true identity of the beneficiaries almost impossible to determine without heavy mobilization of resources, and it is why anonymous shell companies have been dubbed “weapons of mass corruption” by anti-corruption campaigners. 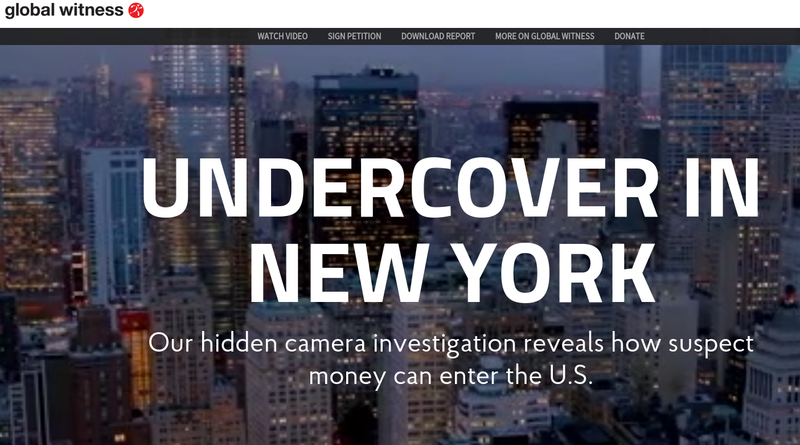 The United States is currently the leading mass-producer of anonymous shell companies, generating 10 times more than 41 other jurisdictions identified as financial secrecy havens combined. Though some states require more information than others when a company is incorporated, none require full disclosure of the beneficial owners who ultimately control it. With a few exceptions—most notably Delaware, which now supports the collection of beneficial ownership information by the U.S. Treasury—a race to the bottom between some U.S. states is underway, as they become increasingly dependent on revenue generated by registration fees. The result is that it currently takes more information to obtain a library card in the U.S. than to create an anonymous shell company, a situation unmatched anywhere in the world except Kenya. “The rest of the world is starting to crack down on secret and illicit finance while the United States continues to play banker to the world’s authoritarian kleptocrats,” said Gary Kalman, executive director of the Financial Accountability and Corporate Transparency Coalition. Researcher Anat Admati calls this “a crisis of the corporate form.” The American company, historically intensely guarded, has become in her eyes bastardized, transformed into a tool that permits those with the resources to exploit it to evade financial liability and act with criminal impunity. This interpretation was largely validated by the 2014 Global Shell Games study, in which researchers approached incorporation agents for assistance in setting up anonymous shell companies while posing as money launderers, corrupt officials, and terrorist financiers. Despite the suspicious nature of their inquiries, it was incorporation agents based in the United States who proved the most willing to help and least anxious to ask questions—putting the U.S. behind traditional financial secrecy havens like the Cayman Islands, St. Kitts and Nevis, or the British Virgin Islands. This state of affairs has led to widescale abuse of U.S. company incorporation, not only by kleptocrats from countries as diverse as Ukraine, Malaysia, and Equatorial Guinea, but also by terrorist groups such as Hezbollah and hostile regimes such as Venezuela and Iran. In fact, Iran somehow managed to purchase and lease out an entire skyscraper on New York’s Fifth Avenue for 20 years without detection. The confluence of two factors has permitted this transformation in the use of American companies. One is the incorporation sector’s omission from affirmative AML reporting requirements. The other is a powerful coalition of state and professional lobbies that resist the imposition of even a non-public beneficial ownership register available only to law enforcement—though this opposition is dwindling as the national security arguments in favor of such a register become more widely accepted. Congress should mandate the creation of a federally overseen register of beneficial ownership for companies and trusts. Incorporation agents should be legally required to perform reasonable due diligence on prospective clients. Penalties should be introduced for failure to carry out reasonable due diligence and/or for intentionally submitting misleading information to the beneficial ownership register. Law enforcement breaks down money laundering into three stages: placement (moving illicit funds into the financial system), layering (concealing their origin), and integration (using the successfully laundered funds for purchases and investments). Whereas the legal community is essential for the placement and layering of kleptocrats’ illicit funds, financial services providers can be engaged to assist with integration. This is the point at which funds are set to work—accumulating value if securely stored in luxury real estate, generating profits if invested in Western business interests, acquiring influence if used for political or philanthropic donations—all the while multiplying the kleptocrat’s wealth into new sources of power. Kleptocrats, or their agents, will solicit financial services providers operating outside the U.S. AML regime not only to open bank accounts, provide financial advice, or transfer funds, but also to present them with investment platforms or opportunities or undertake deals on their behalf.